The Portuguese were the first to make significant inroads into Africa during the age of discovery, yet they were the last to decolonize their African possessions. This was to a large extent true of Portuguese socioeconomic and political activities in the various communities of Africa in which they operated. The Portuguese empire in Africa was the earliest and longest lived of the colonial empires, lasting from 1415 until 1974, with serious activity beginning in 1450. The first attempt made by the Portuguese to establish a presence in Africa was when some Portuguese soldiers captured Ceuta on the North African coast in 1415. Three years later, a group of Moors attempted to retake it. A better armed Portuguese army defeated the Moors, although this did not result in effective political control. In 1419, two captains in the employ of Prince Henry (Henrique) the Navigator, João Gonzalez Zarco and Tristão Vaz Teixeira, were driven by a storm to Madeira. A Portuguese expedition to Tangier in 1436, which was undertaken by King Edward (Duarte) for establishing Portuguese political control over the area, followed. However Edward’s army was defeated, and Prince Ferdinand, the king’s youngest brother, was surrendered as a hostage. Tangier was later captured by the Portuguese in 1471. The coast of West Africa also attracted the attention of the Portuguese. The Senegal was reached in 1445, and Cape Verde was passed in the same year. In 1446, Álvaro Fernandes was close to Sierra Leone. By 1450, the Portuguese had made tremendous progress in the exploration of the Gulf of Guinea. 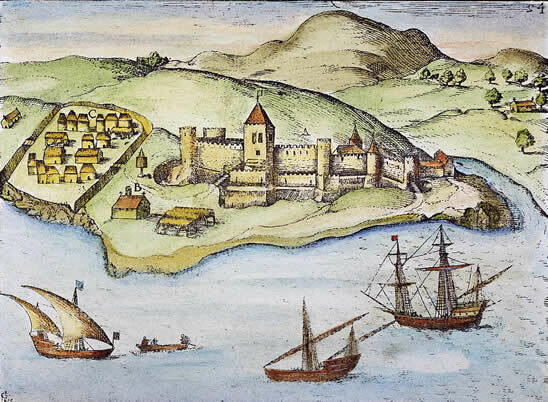 Specifically under João II, exploration had reached the fortress of São Jorge da Mina (Elmina), which was established for the protection of the trade of the Guinea. The Portuguese reached the ancient kingdom of Benin and the coastal part of present-day Niger Delta region of Nigeria before 1480. Oba (King) Esigie, who reigned in the last quarter of the 15th century, is said to have interacted and traded with the Portuguese. The famous Portuguese explorer Diogo Cão sighted the Congo in 1482 and reached Cape Cross in 1486. The Portuguese thus found themselves in contact with one of the largest states in Africa. The leading kingdom in the area was the Kongo Kingdom built by the Bakongo, a Bantu people whose king, the Mani-Kongo, had his capital at Mbanza-Kongo, modern San Salvador in northern Angola. Other leading states in the area included Ngoyo and Loango on the Atlantic coast. When the Portuguese arrived on the east coast of Africa at the end of the 15th century, the region was already witnessing some remarkable prosperity occasioned by a combined effort of Africans and Arab traders who established urbanized Islamic communities in the area. These included the coast of Mozambique, Kilwa, Brava, and Mombassa. From East Africa the Portuguese explorer Pêro da Covilhã reached Ethiopia in 1490. The big island of Madagascar was discovered in 1500 by a Portuguese fleet under the command of Diogo Dias. The island was called Iiha de São Lourenço by the Portuguese. Other Portuguese might have visited previously, as was evidenced in the stone tower, containing symbols of Portuguese coats of arms and a Holy Cross. Mauritius was discovered in 1507. By 1550, Portuguese dominance in both the Indian and Atlantic Oceans had been confirmed. Their position was further strengthened by the Treaty of Tordesillas of July 7, 1494, with Spain, leading to the emergence of a large empire. Some African communities were part of this sprawling Portuguese empire. The needs to establish Christianity and Portuguese civilization were not strong motivators; the aims of the Portuguese were essentially commercial. In the East African region, the Portuguese wanted to supplant the preexisting network of Arab seaborne trade. Consequently, Portuguese bases at Sofala, Kilwa, and other areas such as the offshore islands of Mozambique, Zanzibar, Pemba, Mombassa, and the island of Lamu were established. In this direction, Vasco da Gama took the first step on his second voyage to India in 1502. He called at Kilwa and forced the sultan to pay a yearly tribute to the king of Portugal. This was typical of Portugal’s dealings with the coast, and unless tribute was paid, the town was destroyed. If it was paid, the local ruler was usually left in peace, provided he carried out the wishes of the Portuguese. After Kilwa, Zanzibar was the next place to suffer from the Portuguese. In 1503, a Portuguese commander, Ruy Lourenço Ravasco showed the power of guns by killing about 4,000 men aboard canoes. The men were carrying commodities that were of interest to Ravasco. Available evidence shows that the local men in no way provoked the Portuguese official. Sofala was another center of attraction to the Portuguese. The town was important because it gave the Portuguese control of the gold supply of the interior of East Africa. The town offered minor resistance to Portuguese incursion. Consequently, a fort was built there to protect the Portuguese colony that now replaced the old Arab settlement in the area. Kilwa shared the fate that befell Sofala. As in the case of Sofala, the Portuguese met little resistance there. A Portuguese fleet commanded by D’Almeidas captured the town. From there the Portuguese official then sailed away to Mombassa, where they met strong resistance. Indeed the city was like a thorn in the flesh of the Portuguese. The island was consequently named “the island of war.” However the resistance of the people of Mombassa collapsed and the city was set on fire. Outside the coast the Portuguese were interested in the gold region of the Zambezi. The Portuguese embarked upon such a massive exploitation of the mineral that within a few years of their activities and occupation, the region had withered to an unattractive settlement. This development sometimes created a crisis and revolt from the local people. The first serious revolt to succeed was in 1631 when Mombassa rebelled. It should be noted that it was in an effort to contain uprising from the local people that the Portuguese in 1593 established and garrisoned the great and famous Fort Jesus at Mombassa. Still, the safety and security of the Portuguese merchants were never guaranteed relative to Arab threats. Already a part of the Indian Ocean community was slipping out of the grip of the Portuguese. In 1622, they were ejected from the Persian Gulf and by mid-17th century, the seafarers of the maritime state of Oman were regularly making incursions and conducting raids as far south as Zanzibar. By the middle of the 18th century, the maritime trade of the East African coast was more or less out of the control of the Portuguese and the region had gradually resumed its pre-Portuguese commercial activities that made the area an attraction for many traders. The appearance of the British and the Dutch East India Companies was another threat to Portuguese commercial interests in East Africa. Elsewhere in Africa the Portuguese experimented with the plantation system in São Tomé from where they introduced it to Brazil. Following this development a new era of Portuguese exploitation of Africa started. This was in the area of the slave trade, which lasted for more than two centuries. During the 16th century, the Portuguese concentrated their slave trading attention on the Kongo Kingdom. During the reign (1507–43) of the Christian king Afonso (Nzinga Mbemba), the Portuguese had already started to export young Kongolese across the atlantic in large numbers. Although King Afonso disliked the slave trade, he paid in slaves for European goods and services, which he regarded as essential to his kingdom. Such services included those provided by missionaries, masons, carpenters, and other artisans. King Afonso died frustrated with his desires to see the Portuguese technologically transform his kingdom unfulfilled. Instead the slave trade continued unabated. A turning point in Portuguese exploitation of West Central Africa came in 1575 when Paulo Dia de Novais was sent as a conquistador to Africa. From his base at Loanda, south of the Kongo frontier, several wars were waged against the so-called recalcitrant king of Ndongo, the Ngola. Sometimes the Portuguese made an alliance with the predatory Jaga group encouraging them to wage wars against Ndongo and some parts of Kongo Kingdom. The situation was so chaotic that early 17th century Mani-Kongos had to send petitions to the Holy See through the missionaries urging them to intervene in the matter, but nothing substantial came out of it. Not even the Portuguese Crown could help the situation. This was the development when in 1660 the Bakongo turned to war with the Portuguese. The Portuguese defeated them. Further raids weakened the kingdom. In fact many of the provinces began to break away. By 1750 the once powerful Kongo state had become a shadow of its former self. The high demand of slaves in the Portuguese colony of Brazil put pressure on Ndongo, known as Angola by the Portuguese. The state was the largest supplier of slaves to the colony of Brazil in the whole of Africa south of the equator. The demand was so great that the Portuguese often incited the local communities to wage war on one another in the interest of obtaining slave labor for Brazil. The Portuguese also tried their hands in commodities other than slaves, such as pepper from the Benin kingdom (in present-day Nigeria) and gold from the Gold Coast. However by 1642, the Dutch had permanently ousted the Portuguese from the Gold Coast. This development encouraged both the English and French to join in the competition against the Portuguese. By the 18th century, it was the traders of these countries who became very active in the trade of the Gulf of Guinea, while the Portuguese continued with their slave-trading activities. Meanwhile, before the other European powers joined in international trade, the Portuguese experimented with all sorts of goods. In the 1470s, for example, the Portuguese were able to procure cotton cloth, beads, and other items from the Benin kingdom, which they exchanged for gold on the Gold Coast. The Portuguese also participated in the trade in cowries in the Kongo and its offshore islands. They were also very active in the trade in salt along the Angolan coast. The Portuguese dominated trade in this era because they were better organized compared to the Africans and they were technologically superior. This showed in the way the Portuguese dislodged the Arab traders along the East African coast who had been established in the area long before the advent of the Portuguese in Africa.